I’m living Saving Private Ryan over and over again! Knowing the future can be the ultimate power. It’s not too hard to learn when you start living the same day over and over again. Edge of Tomorrow follows William Cage (Tom Cruise), newly demoted when he attempted to get out of combat in the war humanity is waging against the Mimics, an alien race with the power to manipulate time. It doesn’t take long before Cage is killed on his first sortie as an enlisted soldier and finds himself in a time loop where he wakes up to the previous day every time he is killed. With his newfound ability, he must join forces with Rita Vrataski (Emily Blunt) to vanquish the Mimic threat once and for all. When the movie began, it gave me the impression of last year’s Pacific Rim. It turns out that was no coincidence. While Pacific Rim was inspired by basically all of your favorite mecha-v.-monster anime, Edge of Tomorrow is a movie adaptation of the Shonen Jump light novel All You Need is Kill by Sakurazaka Hiroshi; the name Cage is in fact a westernized Keiji. Similarities to Pacific Rim ended after the opening. We see Tom Cruise plunged into a battle straight out of Spielberg’s notebook, incidentally on Normandy Beach (is this why they shot for a June 6th release date? ), only with a heavy dose of mechs-v.-alien action. While the movie had absolutely solid special effects (I think this was a good time for me to try watching a 3D movie for the first time), what made it for me was seeing Cage’s interactions with the other characters, such as Rita. One of my favorite scenes was actually a quiet one, where Cage and Rita hide out in a farmhouse over a cup of coffee. Cage definitely grew as a character as the movie progressed. The movie’s substance was also adequately backed up with its style. The Mimics were terrifically animated, and I was impressed by the sheer amount of stuff the special effects crew managed to put onscreen at once. Once again, I use the battle of Normandy as an example. While Edge of Tomorrow had similar roots to Pacific Rim, I will definitely say Edge of Tomorrow is better. As you may recall, I did enjoy Pacific Rim a lot. 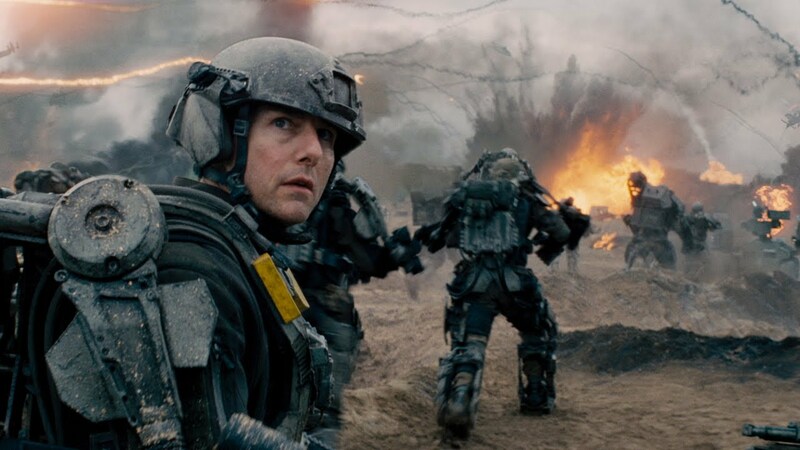 Edge of Tomorrow definitely had less of Pacific Rim’s shameless stupidity (again, I didn’t think that was a bad thing) and it looks to me Tom Cruise is finally back in action as a mainstream actor. I already liked Edge of Tomorrow more than I liked X-Men: Days of Future Past. This summer is already looking like a huge improvement over last.